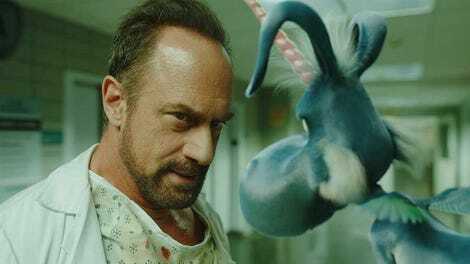 If I was trying to sell someone on Syfy’s new drama Happy!, I would tell them that the premiere episode is kind of like a funnier Punisher or a darker Die Hard, funneled through the lens of hallucinatory drugs. And I mean all of those things in the most positive way. “Saint Nick” introduces us to Nick Sax, wonderfully played by Christopher Meloni. It’s no secret that Meloni is a talented actor—he did years of solid work on Law & Order: SVU and turned in a tremendous performance for the Wet Hot American Summer franchise—and perhaps the biggest reason Happy! works so well is that Meloni makes his rather dark, miserable character immensely likable. He’s so deft at alternating between drama and comedy, even within the same scene, that if Happy! continues the way the first episode went, Meloni is more than up to the job of carrying a show that would be nothing special (or even kind of terrible) in the hands of a less capable actor. As cop-turned-hitman Nick carries out his latest job (to kill the nephews in an Italian mob family), his death wish seemingly comes true... until Nick is shocked back to life by some EMTs. When he wakes up, he is now hallucinating a blue, winged donkey-unicorn named Happy, voiced by Patton Oswalt. Happy has come to Nick for help rescuing Hailey, a young girl who has been kidnapped by an extremely creepy, crack-smoking Santa. Oswalt’s Happy is the other big reason the show works. There’s a reason the comedian has so many voice-over credits on his resume—he’s a talented voice-over actor. And it’s a credit to both actors and the animation department that Nick and Happy have great chemistry together, which is a weird thing to say about two characters who aren’t actually on screen with each other. The Nick-Happy pairing, coupled with two intriguing supporting characters, Blue and Smoothie, plus the operatic violence set against a gritty Christmas backdrop provide enough good things to carry the premiere episode. Which is good, because the actual over-arching storylines are a little weak. Hailey’s kidnapping is only compelling because she’s a little kid in very real danger. That’s high stakes all by itself. But it’s a shame Hailey and her mother aren’t given a little more character development before Hailey is snatched because as it is, there’s not enough time spent with them to establish any kind of meaningful connection. This plot is definitely aided by the reveal at episode’s end that Nick is Hailey’s father. That ups the stakes considerably, but the show could still benefit from establishing the mom and daughter characters more. Hopefully, that’s part of the season and the writers just couldn’t find a good place for it in the premiere. Secondly, the mystery of the mafia don’s password, Det. Meredith McCarthy’s involvement with them and her past connections with Nick and his former life as a cop just aren’t interesting enough yet. Lili Mirojnick feels a bit flat here, though that may be more due to the material she’s given than her acting ability, and there aren’t enough juicy teases about this highly sought-after password to make that seem like anything other than a reason to put Nick on the run. Maybe that’s the entire purpose it serves, but if so, that would also be disappointing. Still, there’s enough to like between Nick’s antihero with a death wish persona, Happy’s optimism and humor, Ritchie Coster and Patrick Fischler’s entertaining take on what could easily become one-dimensional stock characters and the high-powered visuals to bring me back for more. I love the Christmas setting. The villain being Santa is very unsettling (though the entire concept of Santa is kind of upsetting when you really think about it), the holiday musical cues are great and the garish red and green lights cast a nice atmospheric glow around a lot of scenes. This is a holiday show the way Die Hard is a Christmas movie and I love it. Hoo boy, is Carol of the Bells creepy when it’s played slowly over an ominous scene. Yikes. While the evil Santa is obviously a big villain for the season, does anyone else think Sonny Shine, the performer at the concert, is also a total creep who is probably in on it? Keep your eye on that dude. While Hailey and her mom could be more fleshed out, the storyline in general is very upsetting. The dissolve from the “MISSING” posters on the city wall to them superimposed over the wooden boxes was stomach-churning. That’s pretty much every parent’s nightmare scenario right there. The cop who dares to hand Amanda Hansen a card for a grief and loss counselor while she’s reporting her daughter missing? He’s lucky he’s still alive because Amanda had every right to choke him out right there on the spot.